Oh my sweetpeas are blooming with my daisies, pink hydrangas and yellow roses. 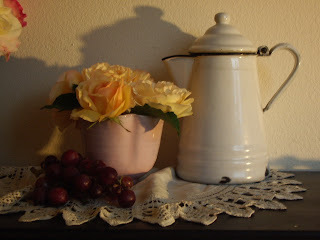 This is a beautiful handpainted vintage pitcher that I love using for floral arrangements. I thought I would share this watercolor painting with you. It is on very heavy watercolor paper. Here is a bouquet of dark pink peonies, I sat it in front of a vintage quilt. 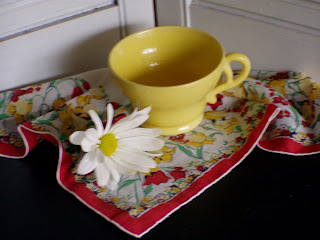 I just love my yellow cup, a white hankie has the sweetest embrodered edgeing. I enjoyed playing with the watercolors by putting the colors from the quilt into the white vase. I have been getting requests to show the watercolor paintings I have done from my still life set-ups. I have this red wall in my office and a narrow black table in front of it that I love to set up my still lifes. I have this vintage metal pitcher and this red metal basket I found at my local antique shop. 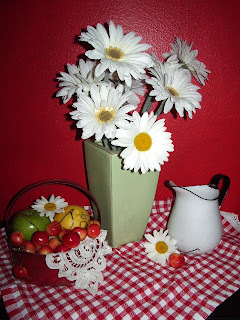 I love this green vase and the daisies came from my garden. I really want to stretch myself and not do a realisim but try for a bit looser, abstract look. It was so much fun to paint. this photo to paint from, the roses are from my garden. 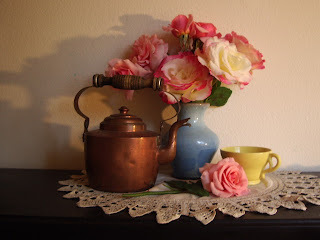 Love this old copper teapot. Here is a still life I set up to do a watercolor from.I painted one of the walls in my office this red color...I was going through a red phase at the time lol. I purchased a long vine of these great yellow berries, I dissembled part of it to make this great little wreath to put my little wool yellow birdie. The deep yellow bow is made from vintage ribbon. I made this wall hanging at the same time as the sewing machine cover. It was when our local fabric shop got their first color copy machine and they had the fabric sheets that we could purchase...Oh what fun I had! 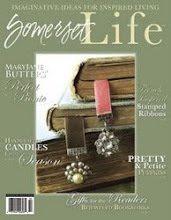 I went through all the vintage books and postcards and sewing machine advertisements that I had collected. Then went through my stash of old pillow cases and buttons and trims. Did I ever have a good laugh when this kitten climbed into my back and started playing with the stuffin. I had a chance to make a few birds this past weekend. I put one on an old ladle that had the handle bent so it can hang. 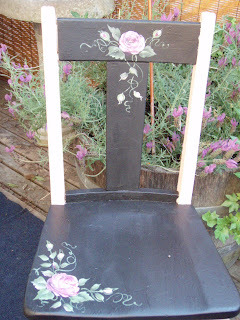 Then I went through a box of goodies and I found this black pitcher that I painted with roses. Makes a great vase! I just put this on ebay. I made this sweet little black bird out of wool it is my own design, I set him on a pincushion made of vintage lace and buttons. The green urn has a band of black and gold glass beads. This stands at 7". 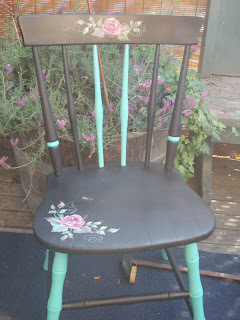 How cute would it look in a garden setting, on a shelf or table. Here is a fabric Postcard that I made. I used stamps and I hand painted the bluebird and heart. I added vintage lace and buttons and a touch of glitter. 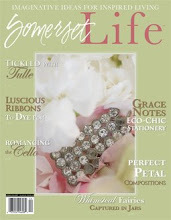 It goes through the mail just fine, if you have your postal person hand cancel the stamp. This is a sewing machine cover that I made a few years back. I entered a contest using this pattern, Hoffman fabrics put it on. I won second place in the U.S. 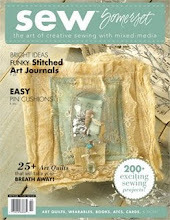 I used vintage items that I had, like the buttons and needle card packets and photo copied them onto fabric. Vintage buttons and lace for embelishment and the fabrics I used the back side of some and others I gave them a little tea bath so everything would have the same tone.